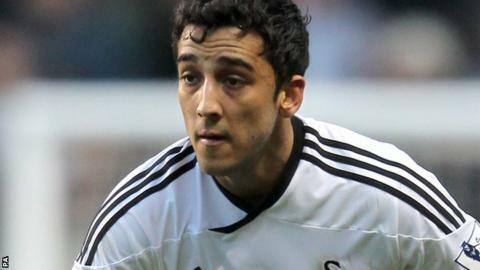 Swansea City expect Wales left-back Neil Taylor to play again within the next few weeks following his "horrendous" ankle injury. Taylor suffered multiple fractures and a dislocation to his ankle in September and was not expected to play again before May. First team coach Alan Curtis said: "He's literally only a couple of weeks away from being available. "But he's got this huge challenge ahead now of Ben Davies in front of him." Taylor's fellow Welsh international Davies has earned plaudits in the form that took Swansea to their historic Capital One Cup win over Bradford at the weekend. But Davies' chance to shine came in the wake of Taylor's injury. Also in Taylor's absence, the Swans have defied those who predicted they would struggle to avoid being involved in a season-long battle against relegation. Former Wrexham defender Taylor, who signed a contract extension with Swansea in December, suffered the injury during the 2-2 home draw with Sunderland on 1 September. Davies has proved to be an able deputy for club and country during Taylor's absence and scored his first senior goal in Swansea's 3-1 win over Stoke City.